We just got a brand new 16TB EqualLogic PS6000E array to add to our EqualLogic SAN with the idea to “retire” one of our PS100E’s and use another PS100E for offsite replication. 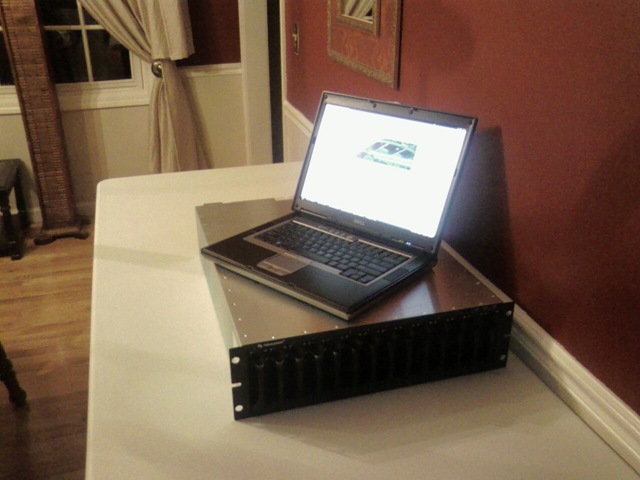 We’d like to sell the retired array to a church/ministry that wouldn’t typically be able to afford an EqualLogic SAN. This would be a great starter SAN for someone just getting into virtualization or someone needing higher performing iSCSI vs something like an MD3000i, Drobo, etc. I’d be happy to give anyone a demo of the interface and setup of the array if you’re interested … the beauty of EqualLogic is how easy/simple they are to setup and manage, especially for small IT shops. We’ve been an EqualLogic shop since 2006 and still believe it’s the best enterprise iSCSI solution out there. Continuing from my prior post on iSCSI switches … this time I found some great info searching through the EqualLogic technical whitepapers. the fact that it must be delivered with minimum delay (latency). without having to discard packets. with switches that may not be adequate for high-traffic networks such as iSCSI. with higher-performance switches that may be acceptable for high-traffic applications. even though their advertising copy implies that they can. high-traffic applications such as iSCSI. a 24-port switch, the internal backplane should be designed to handle 24 Gbps or more. packets because it is getting overwhelmed. momentarily stop sending traffic. This is a benefit if available but is not required. transmission. We have found that a minimum of 256 KB *per port* is a desirable value. the switch will likely be a poor performer in a high-traffic application like iSCSI. speed and throughput to route the packets at wire speed with minimal delay (latency). adequately for an iSCSI network. 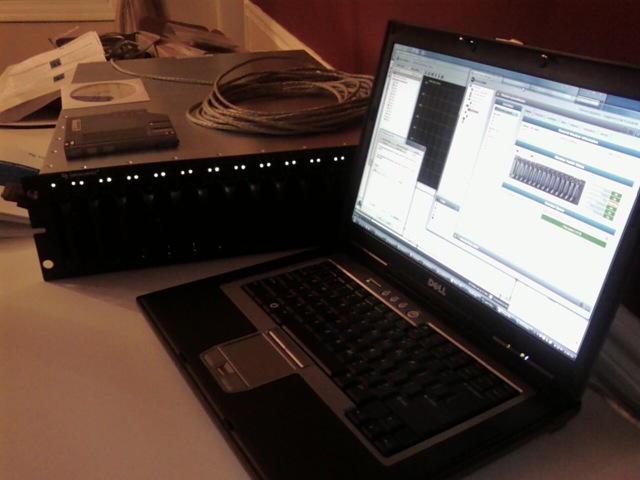 We’ve been using a pair of Cisco 24port 2960G-24TC for our iSCSI network since installing our first EqualLogic array July 2006. We were recommended this model by our EqualLogic SE when we purchased the array. Although we’ve not done any performance testing, we’ve not noticed any speed issues of these switches for almost 4 years. If we were looking for iSCSI switches today, we’d look at HP since we’re using HP switches for everything else. EqualLogic User Conference - What Makes a Good iSCSI Switch? What makes a good switch??? If you’re an EqualLogic storage customer, like GCC, you really should try to make it to the first ever national EqualLogic User Conference March 1-3 in Dallas. 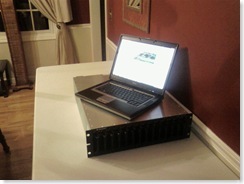 We purchased our 1st EqualLogic array back in July ‘06 and we’ve been a big cheerleader for the product ever since. I’m also hoping to get some tasty TX BBQ … I have found memories of Hard 8 BBQ from the Texas CITRT event last Feb … Mmmmm! New Solutions for Automated Site Recovery from Dell and VMware: The virtual infrastructure enabled by Dell EqualLogic and VMware VI3 technologies now automate disaster recovery planning and execution by natively integrating the PS Series Auto-Replication feature directly into VMware’s Site Recovery Manager software. Honey, there's a SAN in our dinning room!? Wife says this is not an acceptable location, but I just had to fire it up tonight to "play" ... it'll travel back and forth between several locations while we run various tests. In a move that further enhances the Dell EqualLogicTM PS5000 Series as the midrange SAN of choice for Microsoft® Exchange Server, Dell is announcing Auto-Snapshot Manager Smart Copy for Exchange as the latest in a series of “application-aware” snapshot, cloning and data replication capabilities. This application awareness can simplify how IT application specialists can work with PS Series SANs to help improve data protection, disaster recovery and testing-and-development procedures. Smart Copy enhances the PS Series’ host integration capabilities to help reduce the amount of time IT administrators spend managing and protecting Windows® -based business applications. In the case of Exchange, Smart Copy allows administrators to easily automate data validation checks and quickly recover from data loss or corruption. The first Smart Copy feature was announced for Microsoft SQL Server® in July 2007 (press release), furthering the Dell EqualLogic product line’s integration with Microsoft environments and helping to improve the speed and reliability of database and file recovery operations. Smart Copy for Exchange will be available in May at no extra cost with all new purchases of Dell EqualLogic PS5000 Series iSCSI SAN storage arrays and for all existing PS Series customers under warranty or with a current support agreement. But first here's the back story on these boxes. Over a year ago we built 2 of these Intel workstations for video editing work running XP 64bit ... I think 1 box had 4GB ram and the other had 2GB and just a single processor. After several months of fighting strange 64bit driver issues I yanked these boxes from production and bought 2 Dell Precision workstations for our guys. This left us with 2 identical Intel boxes with lots of grunt. Oddly enough it's about this time we were maxing out our aged servers with all the VM's we were placing on them. So we loaded up each Intel box with 16GB ram and added a proc so they were both dual dual-core boxes ... the hope was that these would make great VMware Server host servers. To take advantage of all the ram we bought Server 2003 64bit as the host OS. One of the boxes had a goofy mobo so we got that replaced and since then these 2 have been solid workhorses for us. Would I purposely build a whitebox server if given the choice? Hmm, that's a tough call ... pros/cons on both sides ... that'll make a good future post. Next time we need new server gear we'll look at Intel, HP and Dell. In case you were not already contacted directly, the Lunch and Learn we had scheduled for tomorrow (2/22) at GCC has been postponed to a later date. Most Powerful Telescope Ever - will consume 30TB of data nightly! Think you have data storage issues? WEST LAFAYETTE, Ind. - Purdue University physicists and computer scientists are part of a national project to create the most powerful telescope ever constructed. The Large Synoptic Survey Telescope will capture a 10-square-degree field of view - 3,100 times larger than the Hubble Space Telescope's - and will include the largest digital camera ever constructed with 3,200-megapixels [that's over 3 Gigapixels!]. On Jan. 3, the Large Synoptic Survey Telescope partnership announced a $20 million gift from the Charles Simonyi Fund for Arts and Sciences and $10 million from Microsoft founder Bill Gates. It is estimated that $389 million will be needed for the telescope's construction. "In just its first week of operation, LSST will survey a volume of the universe larger than all previous telescopes combined," said Shipsey, who also is a member of the project's camera construction team. "Over 10 years it will continuously search the universe for change and evolution, making an unprecedented 3-D movie of the universe - the greatest movie ever. the telescope will produce 30 terabytes of data per night that dedicated data facilities will process in real time. "LSST will catalog 10 billion galaxies and 10 billion stars, creating 60 petabytes of astronomical image data, which is equivalent to 100 million CDs, and a 30-petabyte database," he said. "Analyzing this data in real time and making it available to the public is an enormous computing challenge." The Large Synoptic Survey Telescope is designed to be a public facility. The database and resulting catalogs will be made available to the community at large with no proprietary restrictions. A sophisticated data-management system will provide easy access to enable simple queries from individual professional and amateur users, as well as computationally intensive scientific investigations that utilize the entire database. Read full article. Thanks to Tom Templin for the heads up on this.